DrGabe's Miniatures: It's GenCon time! Tonight I'll be running a game of Warhammer 40k Rogue Trader RPG. Here is the crew of the Reed of Darkness. They are due for a tough night tonight. I can only hope they survive. This is a great looking mini. I can't place it though. What fig is it? Looks great, dude! The whole crew looks really good, I'm sure you've concocted lots of horrible ways for them to die! Have fun at the con and take lots of pictures of all the cool stuff. 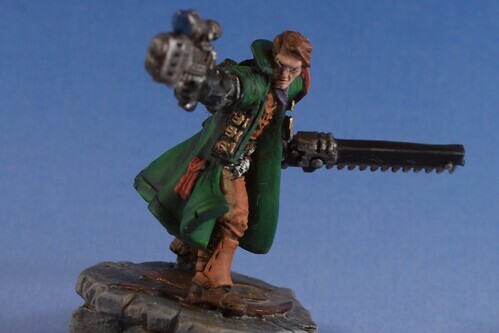 Kevin- its a mod'ed Warmachine model. When I get home I can tell you which one. Got it, thanks. I figured I'd seen it before. I don't own any of these PP figures. Glad to see they compare well in size to the GW figs. I'll start looking a bit closer at them for alternate figures. Thanks! Isn't this a painting site?